Tokyo’s outspoken Gov. Shintaro Ishihara says his country, which suffered history’s only nuclear attack, should build nuclear weapons to counter the threat from fast-rising China. In my interview with Ishihara, published in The Independent today, Ishihara said Japan could develop nukes within a year and send a strong message to the world. ‘All our enemies: China, North Korea and Russia—all close neighbours—have nuclear weapons. Is there another country in the world in a similar situation? Such comments, from the leader of Japan’s second-most powerful political office, come amid concerns about China’s growing military muscle. Beijing announced last week that its 2011 defense budget will be boosted by 12.7 percent to $91.5 billion, up from $81 billion last year. And most experts say that those figures are an underestimate. China officially overtook Japan as the world’s second-largest economy last month. Despite booming bilateral trade, the relationship has regularly been shaken by disputes over territorial and historical issues. Ties are still struggling to recover from a maritime clash last year over the Senkaku Islands, which are administered by Japan but claimed by China. Ishihara’s right-wing politics and persistent warnings about the rise of China have earned him the sobriquet ‘Japan’s Jean-Marie Le Pen.’ But there are signs that the national consensus has moved closer to his brand of nationalist politics since he took office in 1999. A stunning 78 percent of respondents in the last annual survey on Japanese attitudes toward China said they did ‘not feel friendly’ towards their neighbour, the highest rating since the poll began in 1978. Conservatives have long demanded that Tokyo ditch its postwar Constitution, which was written during the American occupation of the country and renounces war as a sovereign right. Japan’s so-called non-nuclear principles, produced during the long reign of Prime Minister Minister Eisaku Sato 1964-72, later committed the country to never produce, possess or allow the entry of nuclear weapons. The principles were partly a response to popular revulsion over the deaths of over quarter of a million people, mostly civilians, in the 1945 US bombings of Hiroshima and Nagasaki. Ishihara claims that Sato, who won the 1974 Nobel Peace Prize for his opposition to plans for a nuclear-weapons programme, was at the same time secretly approaching the United States for help in developing an atomic bomb. ‘Japan asked the US (Lyndon B.) Johnson administration for help in developing nuclear weapons but America refused. If the Sato administration had unilaterally developed weapons then, for a start North Korea wouldn’t have taken so many of our citizens,’ he said, referring to Pyongyang’s abduction of an unknown number of Japanese people. Sato had in any case undermined the no-nuke rule by striking a backroom deal with Washington, signed with then-President Richard Nixon in 1969. The pact allowed nuclear-armed US ships and aircraft to traffic anywhere through or over Japanese territory and was confirmed by a senior Japanese Foreign Ministry bureaucrat in 2009. 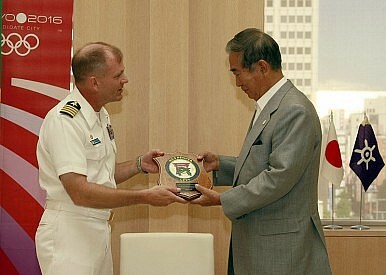 Ishihara also suggested that US President Barack Obama’s 2009 pledge to rid the world of nuclear weapons wasn't genuine. ‘Obama said “yes we can” when he promised to abolish nuclear weapons, then followed it with “but we don’t.” The US is still making computer simulations of new weapons. Japan should do the same,’ he said.